Mary-Dell Chilton, a science fellow at Syngenta, is inducted into the U.S. Department of Agriculture's Hall of Heroes for her accomplishments. 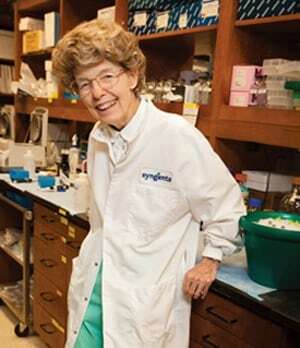 Mary-Dell Chilton, Ph.D., in her lab at Syngenta in Research Triangle Park, North Carolina. The U.S. Department of Agriculture (USDA) recently inducted Mary-Dell Chilton, Ph.D., a distinguished science fellow at Syngenta, into its Hall of Heroes in recognition of her groundbreaking contributions to agriculture. Chilton's work with plant biotechnology led her to produce the first transgenic plant in 1983 and showed plant genomes could be altered more precisely than previously thought. Her research at Syngenta eventually resulted in improving the ability of plants to resist insects and diseases and tolerate extreme environmental conditions. "I am proud of my efforts and my Syngenta colleagues' continued drive to innovate new ways to deliver solutions to farmers," says Chilton. "That's what it's all about." Chilton's fellow Hall of Heroes inductee was the late Cesar Chavez, an American farm worker, labor leader and civil rights activist who co-founded the National Farm Workers Association. Plaques in the entry hall of the USDA federal building in Washington, D.C., will serve as permanent tributes to Chilton and Chavez. This recognition is one of many honors Chilton has received in recent years. Other honors include being awarded the World Food Prize in 2013 and being inducted into the National Inventor's Hall of Fame in early 2015. Acuron corn herbicide, Agri Marketing magazine’s new product of the year, will help growers control troublesome weeds.